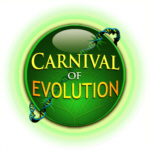 Yes, Evo-T’s is breaking out of the text only genre and moving into the world of graphics. Our first offering is a stylized germ (an original creation by yours truly) in both black (pictured above) for lighter colored shirts and white for darker ones. As always there are both men’s and women’s cuts available. A percentage of every purchase goes towards keeping this blog running and keeping my lights turned on. Special thanks to my brother-in-law, George Pizarro, for helping clean up my pencil drawing into a presentable computer graphic image! Perfect! This shirt comes in basic black with white print, in sizes for both men and women. Support Bacteria! They’re the only culture some people have. Come on, you know that’s funny! 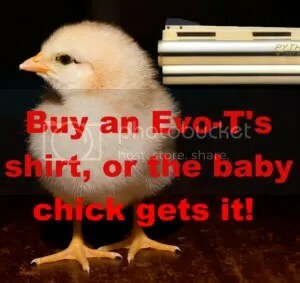 Now, I command you to go buy one! They come in both men’s (dark green) and women’s (lighter green) sizes, with white print. Please, I don’t want a repeat of the last time. Yellow down and gore everywhere (yuck). 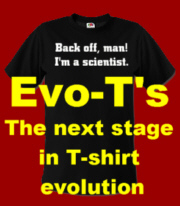 Yes this is a shameless commercial post for my internet T-shirt shop: Evo-T‘s (hey, I’m poor and domain names and science books don’t pay for themselves). This shirt comes in navy blue with yellow print, in sizes for both men and women.